When Bill Trabucco and Anna Reynolds Trabucco went looking for a piece of property in Nevada County, where Anna grew up, they set out to find a 50—200-acre parcel. “Something bigger than a ranchette,” Bill explained. As it ended up, together with members of Bill’s family, they purchased the 980-acre ranch they have named Linden Lea. Bill, a San Francisco native, had always wanted to be “independent and self-sufficient”; a goal, along with a deep love of the land, he shared with Anna. The ranch was a dream come true. Cattle roam freely on the gently sloping hills of Linden Lea Ranch.Photo by Alyson Aquino. Jim Gates, who traces his family’s history in the area back to the 1870s, manages the ranch and leases the land for grazing his herd of 150 cattle. The beef—15 tons produced annually—is sold at the local co-op. 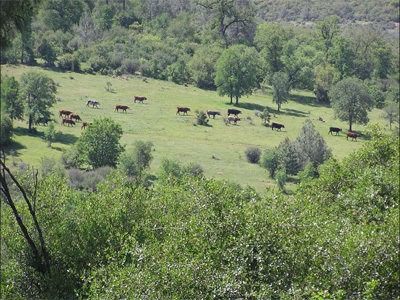 The home of Nevada County Free Range Beef, Linden Lea does its part to benefit the local economy. The property’s contribution to the community doesn’t stop here. A 120-acre timber plantation produces wood that the Trabuccos hope to sell locally as it matures. The grass-fed cattle not only produce excellent beef, they also maintain an important natural balance. The native grasses require grazing to preserve them; this, in turn, prevents fire and leads to natural reforestation. The entire ranch is in the South Yuba watershed and two-thirds of it is in Kentucky Ravine. Seasonal streams maintain the land’s riparian habitat and provide water for the cattle. A steep drop prevents the cattle from accessing the Yuba River. Their decision to donate a conservation easement on 760 acres of Linden Lea came about as the Trabuccos, who have no children, considered what would become of the land in the future. They contacted the Nevada County Land Trust (NCLT) and the work began. Acknowledging that the process requires diligence and patience, the Trabuccos believe it was well worth the effort. They have high praise for NCLT and described the process as “the ultimate exercise in property rights. You decide what can and can’t happen. We wanted the land to continue to be used for agriculture; the conservation easement assures this.” Further, conserving a large piece of land maintains the ecosystem that native plant and animal species need to survive. The conservation easement also includes a 50-acre blue oak preserve, protecting what is rapidly becoming an endangered species.